The blessings my career has brought me continue to manifest in my life every single day, and I am more grateful for it than I can articulate. As a lifelong fan of literature and the spoken word, it still boggles my mind that every single day of my life I am afforded the privilege of narrating exquisite works of art—and get paid for it! 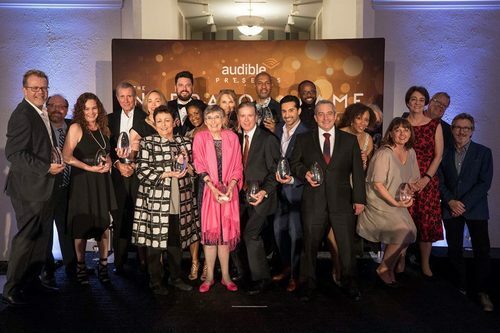 One day this past November I awoke to the news that I’m part of the inaugural class in Audible’s Narrator Hall of Fame. My thanks to everyone who helped me along the way to this wonderful honor, I am hugely grateful. 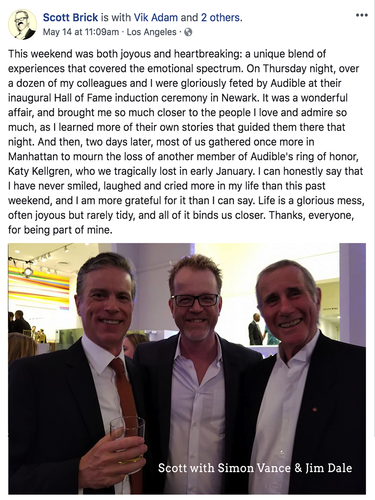 The induction ceremony (on May 11, 2018) was easily one of the most memorable nights of my life, but not because Audible flew me to Newark, New Jersey, or invited me to a champagne toast at their headquarters before the ceremony with all the other inductees, or even because of the gala induction ceremony itself, where I got to hang out with each of the twenty others granted this honor. (Or the families of the posthumously honored narrators—Ed Hermann, Katy Kellgren and Frank Muller—who I was delighted to see had been flown out as well. Well done, Audible.) No, it was memorable because I was able, for the first time in my life/career, to publicly thank the people who are most responsible for my success: my parents, Bill Brick and Sandra Hanes; my high school theater teacher, Mike Frym; my production manager, Gina Smith; and my partner of many years, Tess Masters. Given the forum to thank them all publicly, I couldn’t maintain my ridiculously thin veneer of cool indifference I’d tried to cultivate all night, and wound up blubbering at the microphone when it came time to accept the statue they presented me. I will remember that night—and that opportunity—always. Being elected to Audible’s Hall of Fame is easily the most surreal experience of my life. 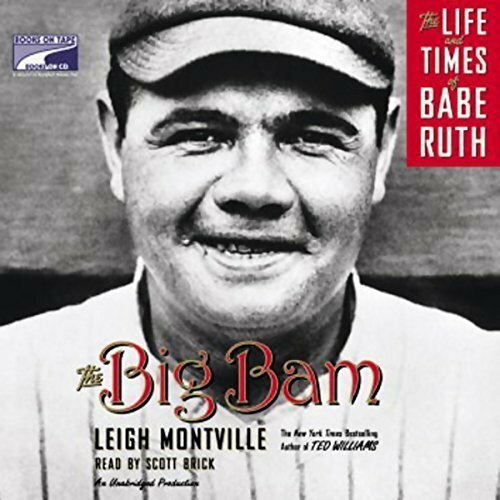 As a sports fan, I’ve grown up in awe of the men and women worthy to be designated Hall of Famers, but never entertained the possibility of it happening in my life (hence the Babe Ruth reference in the title of this blog, a member of the inaugural class of the baseball hall of fame in 1936, the earliest sports HoF I'm aware of. And while I don’t feel even close to worthy, I am nevertheless hugely grateful for the honor. Like my peers, I didn’t come into this industry for accolades. We work in isolation, after all, reading alone in a room. And in some ways, I try to maintain that isolation. Don’t get me wrong, I love a nice review like anyone else, but I try not to read them, because good or bad, they’re one person’s opinion. (But while I don’t typically read reviews, I ALWAYS read messages sent through my website or on social media and am grateful for each and every one!) If you’ve spent any time in Hollywood, you’ve likely heard the saying, “Oh, he believes his own press.” Staying away from reviews or blog sites keeps me from doing that, but also protects me from getting bogged down by negativity. Yes, I will absolutely post the occasional rave for a project I’ve worked on, but I do so primarily to help publicize the book, as well as to honor the author and the publisher and show my appreciation for the faith they’ve shown in me. That’s both good manners and good business. Beyond that, though, I try not to pay attention. While speaking at a conference a few years ago, a fan approached me on the street and asked how many narration awards I’ve won, and I told her truthfully, “I don’t know.” I kinda don’t want to know, you know? Thank you, Audible. It’s been a lovely nineteen years, and I am deeply grateful. "The voice of Audible! 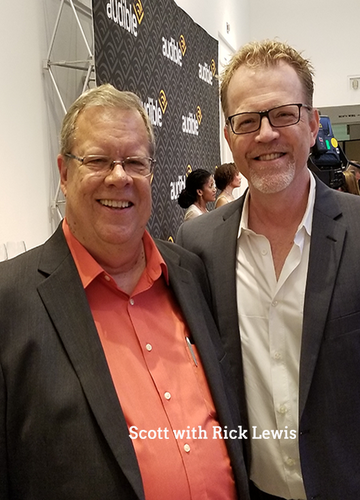 (No, not me, Rick Lewis! He's the voice you hear on EVERY SINGLE AUDIOBOOK EVER SOLD ON AUDIBLE, saying those immortal words at the beginning and end of each book: "This is Audible" and "Audible hopes you have enjoyed this program." I was ridiculously excited to meet the man behind this iconic voice. It's an honor to be inducted into Audible's HoF along with this man." "The schedule for one of the coolest nights of my life. 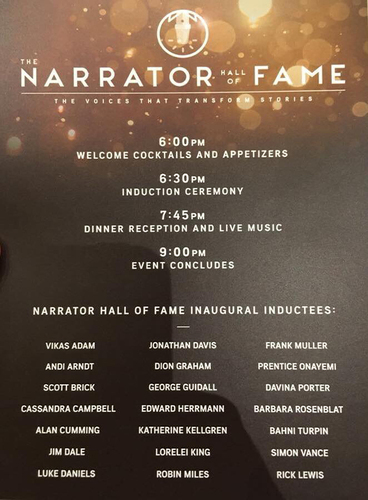 FYI: every one of the narrators ran soooooo much longer on their acceptance speeches that Audible probably had to cover a ridiculous overage on the cost of the venue. And bless them for doing so!" 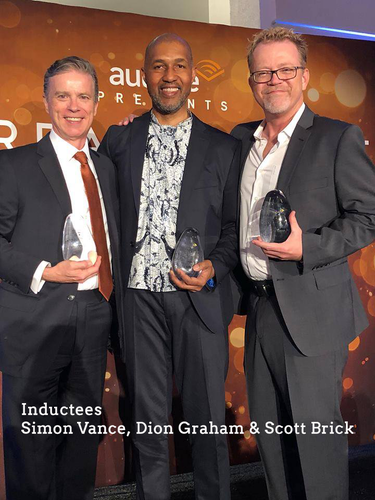 "Fellow honorees Simon Vance and Dion Graham, two men I'm privileged to call some of my dearest friends and colleagues. One of my favorite. Photos. Ever." "My Facebook post upon returning after the Hall of Fame weekend. Easily one of the most emotional weekends of my entire life." "I have never felt more honored to be associated with a group of people as I am with these folks. Thank you, Audible, for including me in a group with such luminaries."